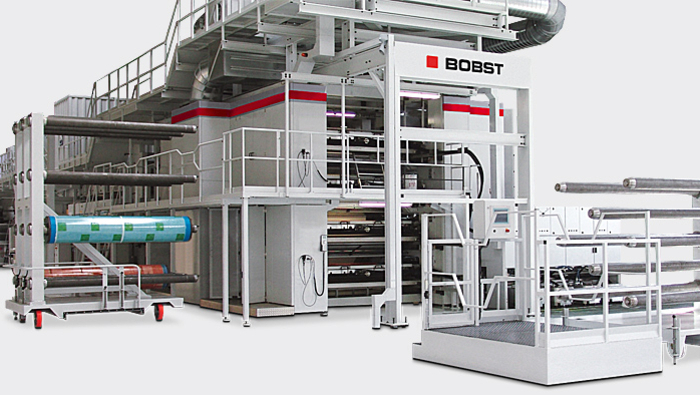 Bobst is one of the world’s leading suppliers of equipment and services to the flexible materials industry. Canflexographics is very proud to be the Sales Partner for the Bobst web fed products within Canada. Please visit the BOBST Website for more specific details on the equipment outlined below. For over 125 years, BOBST has actively contributed to the development of the printing industry and today the Fischer & Krecke range is dedicated to producing web-fed, CI flexo printing presses for the flexible materials industry. Cutting edge technology and high manufacturing standards ensure premium print quality and long-lasting value. 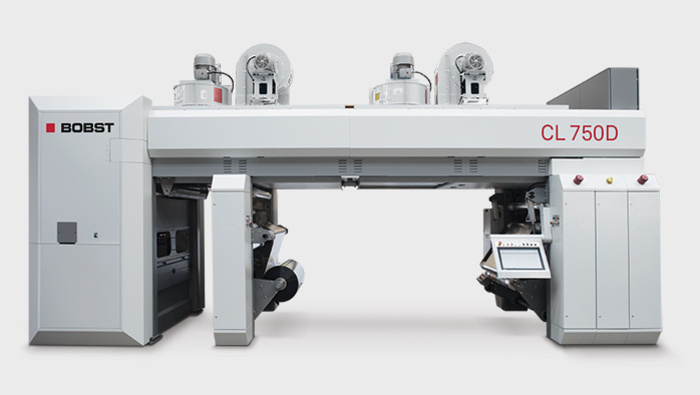 With their varied repeat lengths and medium to super-wide printing widths, BOBST CI flexo presses meet the requirements of the most demanding package printing applications. The BOBST 20SIX is an advanced Central Impression (CI) flexo printing press for flexible packaging printing. Capable of producing all run lengths from very short to very long with equal efficiency, it can handle all substrates used for flexible packaging at widths up to 1650 mm (65 inch), repeats up to 1200 mm (47.2 inch), and speeds up to 600 m/min (1968 ft/min). The compact design in conjunction with user-friendly handling concepts and the optional smartGPS™ digital off-press impression and registration setting system allows for the fastest change-overs in the industry. Featuring the same technologies as the BOBST 20SIX, the extra wide 40SIX is designed to meet demands of large volume and large format production. 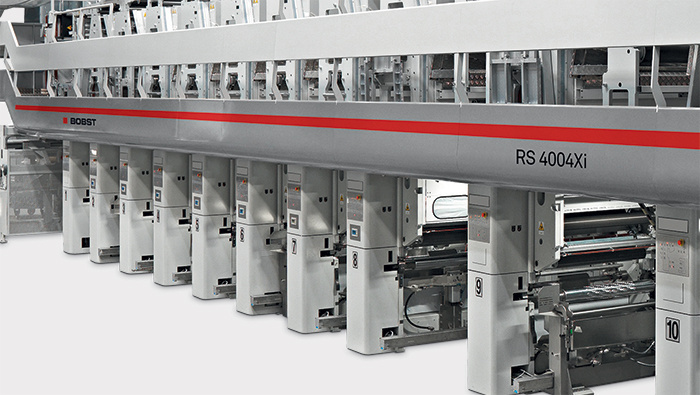 Being capable of printing on film, paper and non-wovens in a wide web tension range, the BOBST 40SIX is suitable to cater for all industries including hygiene, food, pet food, detergent, bags and sacks. Offering significant competitive advantages, the 90SIX preprint press is the spot on solution for your specialized business. The sophisticated mechanical and electrical design of the 90SIX allows for converting paper and linerboard in a range between 40 and 240 g/m2. This gives you an unparalleled flexibility with substrates and enables you to meet a wide range of your customers’ requirements. However demanding the job may be, you can be sure to obtain premium quality graphics close to offset quality; on widths up to 2’800 mm (110″) and repeats up to 2’060 mm (81.1″). Thanks to the unique combination of CI design, sleeve change technology, servo drives, Access and AutoClean systems, and smartGPS™ you can achieve the changeover times – inclusive of the largest formats – that make even smaller runs profitable. As the 90SIX is capable of converting even low grammages, this helps to further increase the efficiency of your linerboard products by considerably reducing the material costs. The MW presses, available as 8-color and 10-color models, perfectly meet today’s market demands on a CI printing press for quality of printing, and flexibility with job lengths and substrates. While printing with a resolution not seen before in CI flexo, the MW is capable of handling a mix of job lengths from ultra short to long runs always in the most cost-efficient way. 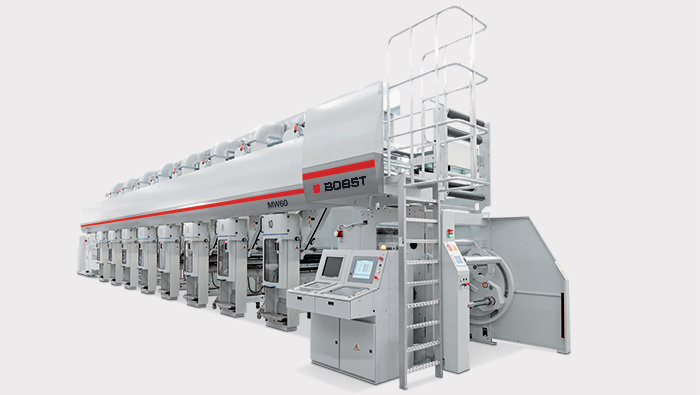 When using BOBST’s unique smartGPS™ technology for digital, off-press register and impression set-up, and considering the reduced costs for plates and inks for mid-web applications, the MW presses are the most efficient presses for short-run production on the market. BOBST has been involved in the design and manufacture of rotogravure printing presses for more than 75 years. 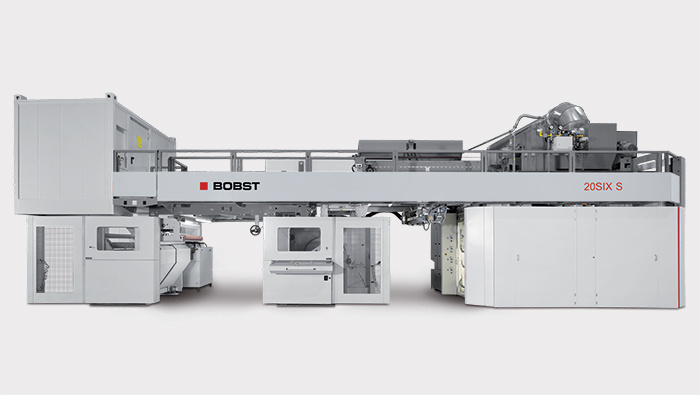 During that time BOBST, has continuously used their thorough knowledge of the process and of the market’s specific requirements in order to deliver the most productive and profitable solutions to the flexible material and folding carton industries. The RS 4004X is the latest evolution of the hugely successful RS 4004 rotogravure press platform of printing solutions. The RS 4004X incorporates several technically innovative advanced features and automations which enable the press to handle in a cost-efficient and profitable way a mix of different job types. To fulfill the needs of a broad range of diverse production requirements, the RS 4004X rotogravure printing press can be configured for a very comprehensive range of market segments and applications in flexible materials. 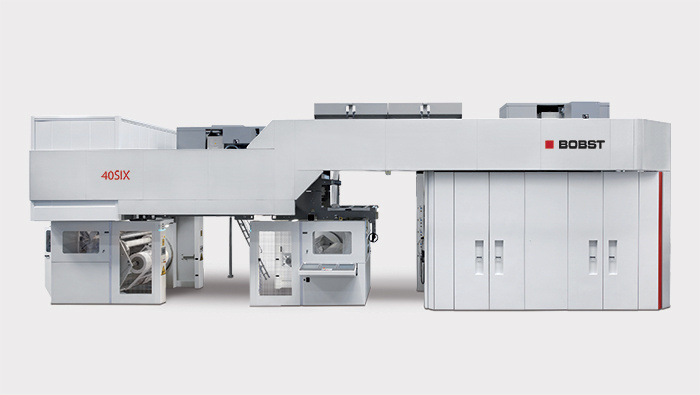 In the sphere of short or ultra short run gravure printing equipment, BOBST engineering has succeeded in identifying and advancing the application of a technological breakthrough: the Minimized Waste MW gravure press which addresses and unlocks the benefits of both increased profitability and environmental sustainability. True to their name, the MW 60 and MW 80 presses minimize waste in gravure printing to an unprecedented level in all the various segments of printing applications through innovative press design and automation. The modular design of the MW 60 and MW 80 presses, provide for in-line special applications like UV or EB curing, die-cutting, lamination, reel-to-reel or reel-to-sheet delivery, making it possible to configure Minimized Waste gravure printing lines for a very comprehensive range of flexible materials market segments and applications. The growth of the flexible packaging industry has led to an increased need for high quality and technically demanding composite structures. Since the 1960’s BOBST, has been offering laminating machinery that complements its range of high performance gravure printing and converting equipment. The continuous success of BOBST laminating machinery is quite simply because the strengths of the equipment are consistent with what is important to its users – ease of operation, high performance, little wastage and low impact on the environment. The name SL 1000 identifies a platform of duplex laminators dedicated to solventless applications. Each machine configuration has been developed to be the most cost-effective and productive solution for the user’s specific requirements. 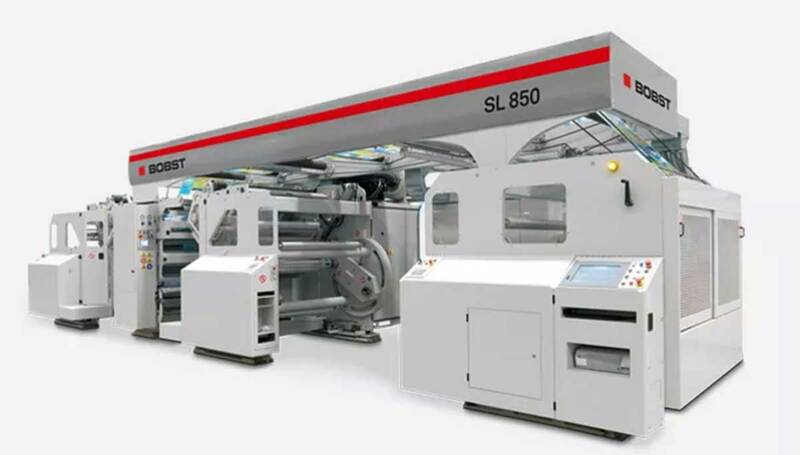 One of the hallmarks of BOBST ‘s laminators is the highly sensitive web tension control system which can be maintained at extremely low tolerances for a wide spectrum of flexible substrates with different physical properties and varying thicknesses. These can include different material combinations from thin aluminum foil to plastic films and paper. Available in two different layouts, the SL 1000 also provides the possibility of further customization in terms of web width, shafted or shaftless winders and reel diameter. All configurations provide for very fast job make-ready and changeovers with minimum downtime and material waste. The SL 850 is a duplex laminator dedicated to solventless applications. It is a compact and efficient machine with superior specifications and performance in terms of machine productivity and quality of laminated products. 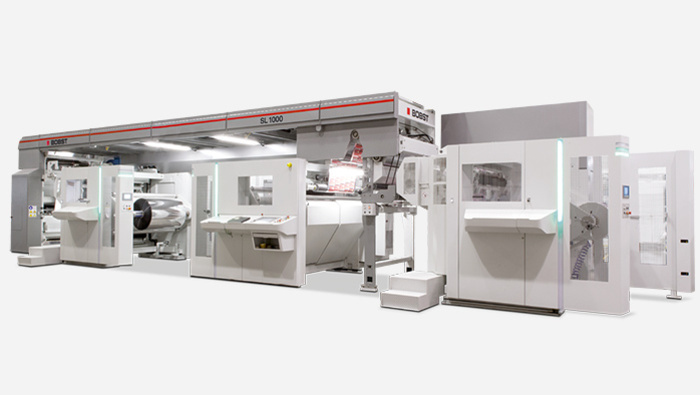 One of the hallmarks of BOBST’s laminators is the highly sensitive web tension control system which can be maintained at extremely low tolerances for a wide spectrum of flexible substrates with different physical properties and varying thicknesses. These can include different material combinations from thin aluminum foil to plastic films and paper. The machine layout affords optimum user-friendliness which combines with advanced technical features and functions to enable very fast job make-ready and changeovers with minimum downtime and material waste. The new CL 750D duplex laminator complements and completes the range of BOBST laminating solutions by adding to the portfolio a compact multi-technology machine. Compactness means minimum space requirements, fast installation and commissioning, and a competitive cost of investment that the CL 750D offers in combination with the technological advances and guarantees of total quality and reliability of BOBST existing top of the line equipment. These include precise tension control of the webs to be laminated, accurate and efficient adhesive metering at any speeds, as well as ergonomic and environmentally friendly machine design and running. Featuring 1000, 1300 and 1500 mm (40, 51 and 59 in), down to a minimum web width of 400 mm (15.7 in), optimum accessibility to all machine sections and HMI with easy job storage and recall, the CL 750D laminator satisfies requirements from ultrashort run production to the most critical substrate combinations using solvent-based, water-based and solventless adhesives.